Eons ago, back when I didn't have a website and I still blogged over at Blogspot/Blogger, I used to run a special "item of the week" feature. I've decided to bring this feature back because I love how it allows me to really put the spotlight on one particular piece - to give more detail behind the design and why I love it! I'll also be offering the special item at a discount for the week it is featured. For the first item of the week I chose the Desert Fan Earrings, a personal favorite of mine from the Earth Relics collection that I put out last year. Last year I was really finding myself drawn to larger, more organically shaped stones and wanted to find a way to showcase some of these stones in earrings. That alone is a challenge as larger stones have a quite a bit of weight to them. I prefer to design earrings that are lightweight and easy to wear. 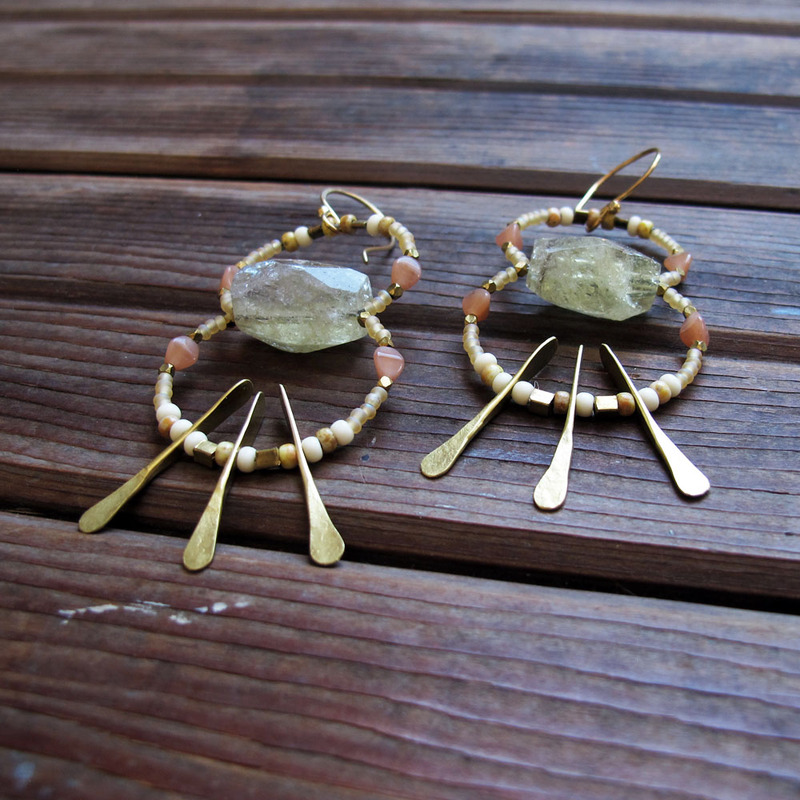 These particular rutilated quartz stones I used were the perfect size: large enough to showcase the natural beauty of the stone, but small enough to not be too heavy for earrings. I also knew I wanted to incorporate elements of beadwork into the design with some hand-forged metal components. The soft palette of these reminds me of a sunrise over the Arizona desert, and an overall softness and softening of my approach towards life that needed to happen at the time. If you love these and want to get a pair before they sell out (there are 3 pairs left, all of the Earth Relics pieces are very limited editions), then head on over to my shop and use the code "desertfan" for 40% off now through next Monday, when I'll release a new item of the week! And happy Monday to all!